We are a team of dedicated windsurfing and kite surfing enthusiasts who want to share our exquisite location with others like minded. The 23 years we have been running the cape sports center have given us much pleasure in improving our facilities and services, to round up a comprehensive product we can offer to your clients. With a small team we endeavor to make our clients feel comfortable well looked after. To make your stay spacial and to see you leaving with the intention of coming back is our goal. We are Importers, wholesalers and retailers of :- Tabou boards, Gaastra Sails & kite boards, Select Fins, Vandal Sails, BIC kayaks, BIC surf boards, BIC boats, BIC SUP’s, Powerex masts, Fiberspar masts, Pro-Limit kite & windsurf accessories, Unifiber accessories & BIC Open yachts ( on special order ). Contact Esti & Antony Teale, 98 Main Street, Langebaan, 7357, West Coast, Western Cape, South Africa. The Cape Sports Center South Africa. The center was established in 1993. Those more than 20 years of expertise show in our well organised establishment as well as in the quality of service we offer. The turquoise blue water of the 20km long X 1,5km wide lagoon offers exceptional flat water Windsurfing and also magnificent Kite surfing for beginners through to advanced. The wind direction in summer is side shore and the wind statistics show that from October to March we have 20 – 25 days wind over 20 knots per month. From November through to February one can expect some days of up to 35 knots. In the early mornings is the best time to rent a stable Sea Kayak and venture into the lagoon to see all the birds, seals, penguins and sea life around you. Surrounding a 600m2 rental section, is grass to rigg on and also a place to sun bathe out of the wind for the family. There is a great look out platform / bar where one can see a great deal of the lagoon and watch all the action from. This perfect combination of wind, water and infrastructure has brought the German Surf Magazine to us to do their Mega Windsurf Test every year, since 1996 until now. The Lagoon is ideal to test their freeride freeride equipment. The Sports Center offers a family friendly place to enjoy the watersports as well as the comfort of a well established infrastructure such as bathrooms, shower, Change rooms, Shop and Bar. A full day of fun and relaxation can be spent with us at the Sports Center, with never a dull moment. The Surf Shop has all the latest Quiksilver, Roxy, Fox, Rip Curl clothing, Oakley sunglasses and other accessories. 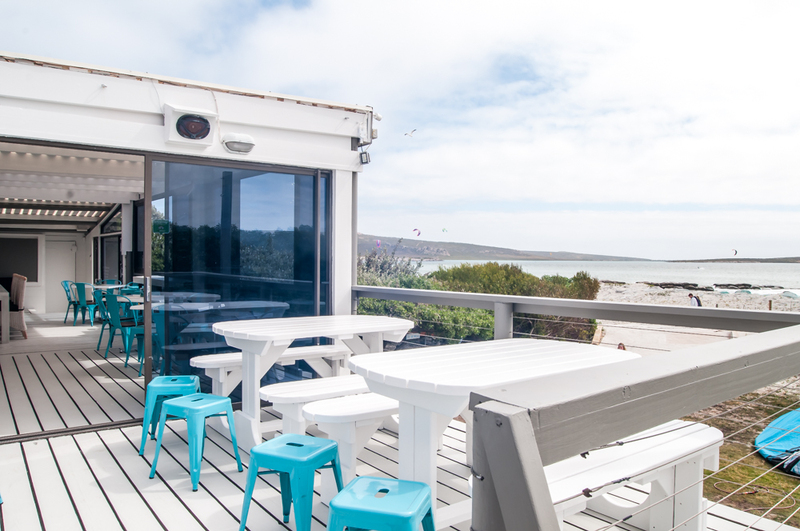 The friendly Wunderbar is a stylish new addition to the Center, overlooking the lagoon. We offer specialty beer & wine and Tapas as well as a menu for the bigger hunger. Life bands and DJs are entertaining during the summer season. Our courses on offer will teach you how to Kite or Windsurf, Stand up Paddle or Kayak. Get in touch with us for a booking with our instructors. 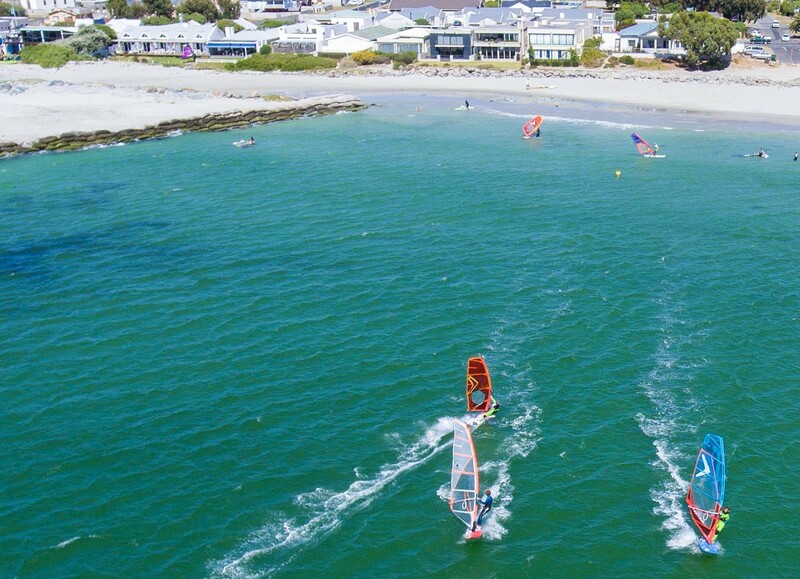 The Cape Sports Center offers for rental the latest Tabou Windsurf boards and the latest Gaastra and Vandal sails all rigged and ready for use. We also do lessons for Windsurfing & Kitesurfing and rentals of Kite surfing equipment, wetsuits and float vests. In addition we have Surfboards, Body boards & Stand up Paddle boards for rental. The equipment is maintained in top condition throughout the season. Change rooms and warm showers are available.